Nose: Oak, Saltwater taffy, golden raisins, Crème brûlée topped with mixed berries. Palate: Full-bodied and sweet. Caramel apple, burn. Finish: Complex and long-lasting. Menthol cough drops fellowed by oak, followed by raisins. Parting words: KELT is what we would call an NDP (Non-distiller producer) product in the bourbon world, but what they call a négociant in Cognac. Monsieur Kelt buys spirit and ages it, in this case on a boat. Like Jefferson’s Ocean bourbon, it’s a silly gimmick, but the end result is pretty good. This is a solid product all around but the finish is what was most striking. I don’t think I’ve ever had a spirit with a finish close to that. I like it, but I could see myself getting sick of it after a while. $71.47 is an odd price and it’s just about as much as I’d be willing to pay for a whole bottle. Luckily, smaller sizes are available in Michigan and elsewhere, so you can make an informed decision. KELT VSOP is recommended. This post is a look at the new items for May 1, 2016. The LARA website with links to lists in the recent past is here. Caps retained out of laziness but with full names given where the state has abbreviated them. Proof (Michigan lists everything in terms of US proof which= 2 x %ABV), bottle size in ml and retail price are given for each one. I have added notes at the end of each if I think it necessary. Some items are not actually new, but fell off the list for some reason and have been added back or are new bottle sizes for items already on the list. Sometimes an item will be added and removed at the same time. I think this is a way to make corrections, but it’s still puzzling. For the sake of brevity, I have excluded apparent corrections from this post. Some new items are also gift pack versions of existing items. These are always the same price as the bottle alone. Apologies for the lateness of the post. My wife had a baby. DAVENPORT’S AMERICAN BLENDED 80, 750, $18.99 Blended whiskey from Davenport, Iowa’s Artisan Grain Distillery. Unclear if this product is sourced or partially sourced. MAYOR PINGREE-10 YR 110, 750, $89.99 New line of bourbon from Valentine in Ferndale, Michigan. It’s named for former Detroit mayor and Michigan governor Hazen Pingree (1840-1901), a progressive Republican who is widely considered to be one of Detroit’s greatest mayors. WILD TURKEY 81 81, 200, $3.48 This is just about the maximum amount of WT 81 I would want to drink in the span of a lifetime. RHETORIC-22 YR 90.4, 750, $99.99 How can we miss you if you won’t go away? YIPPEE KI YAY 92, 750, $64.99 Yippee ki yay, mother lovers, this new blend of straight rye whiskeys from High West was available just in time for mom’s special day. The proportions of the blend are kept secret (didn’t think this was allowed but whatever) but the two ryes in question are from MGPI of Lawrenceburg, Indiana and Barton-1792 of Bardstown, Kentucky. GLENMORANGIE ORIGINAL 86, 1750, $89.99 Newly available family size is great for VBS picnics. CAMPAGNERE COGNAC XO 80, 750, $169.98 The XO joins last month’s arrivals the VS and VSOP. It’s the oldest and by far the most expensive of the three. AZUNIA REPOSADO 80.0 750 6 35.70 33.92 39.99 Azunia Black was on this list last month. Walton relaxing after some Azunia. The rest of the line arrives this month. As noted previously, the blanco and reposado are made from organically grown agave. Distilled at Agaveros Unidos de Amatitán, 50 miles or so northeast of Guadalajara. They are also partnering with basketball great Bill Walton for some reason. I received a polite email a few days ago from Mychal Diaz of Southern Champion company, makers of Buzzballz premade cocktails, encouraging me to take a look at their new website and get some more accurate information into your hands, dear readers, regarding their products that were on the New Items list back in February. Their company is a relatively new one, founded in 2010 by inventor Merrilee Kick of Carrolton, Texas. The company was founded around Kick’s concept for BuzzBallz was for an unbreakable, unspillable quality, full strength premade cocktail for camping, picnics, tailgating, etc. She invented the what the website claims is the first plastic beverage can for this purpose. Recently they have expanded into spirits with XII Kings Vodka, Andrew Johns Gin (both domestically sourced, filtered, proprietarily processed then cut with Texas water), Pelican Bay Rums (a blend of rums from around the Caribbean) and Crooked Fox blended bourbon (sourced from Kentucky and Tennessee). They are NOT the same spirits used in BuzzBallz. There is also have a wine listed on the website, Closet Freak California Muscat. I asked about additives in their spirits as well but there was no response to that question. They will start rolling out nationwide this summer. Walton Photo: Press release here. Andrew John’s Gin: Southern Champion spirits. Used by permission. Nose: Raisins, old oak, fig, alcohol. Palate: Soft and mild. Oatmeal raisin cookies. Finish: Dried fig, dates, alcohol, vanilla. Parting words: The Camus Cognac house dates back to 1863. Unlike its much bigger competitors it is family and French owned, and always has been. The current president is Cyril Camus (b. 1971), a descendent of founder Jean-Baptiste Camus (b. 1835). They also share similar facial hair. Cyril created the Elegance line of entry level, age category cognacs, and the Borderies XO, made with grapes from the family vineyards in the Borderies sub-region of Cognac. He also began a line of cognacs made entirely with grapes from Île de Ré, a small island (33 square miles or so) off the coast of western France. Frankly, Camus produces a bewildering number of products for such a small company. The Elegance line, as mentioned above, seems to be intended as an entry level product line. It also includes Elegance VSOP, XO and Extra (in ascending order of age). The VS is the least expensive but the VSOP is affordable as well. Unfortunately, the state of Michigan does not carry the VS, but the VSOP retails for $39, which is not bad in the grand scheme of things. Michigan also carries Elegance XO ($157), Borderies XO ($177), Extra Elegance ($500) and Cuvee 5.150 ($14,000). I expected this brandy to be mixing quality at best. I was pleasantly shocked. The fruity quality of the distillate clearly takes the lead here, but it’s very good on its own and is balanced with enough cask character to keep it from tasting like an unaged eau de vie. I tasted from a 50 ml bottle so I didn’t quite have enough to try it mixed, but I can see the assertive fruit getting in the way of some mixers. Or maybe it wouldn’t. What I can say with certainty is that Camus Elegance VS is very good. Recommended. Nose: Alcohol, rancio, orange peel, almond extract, cherry, vanilla. Palate: Full mouthfeel. Semi-dry. Roasted almonds, Queen Anne Cherries, white mulberries, white wine grapes. Finish: Golden raisins, old oak, leather. Lingers for a very long time. Parting words: I’m not in the habit of buying $150 bottles of anything, let alone Cognac. Luckily I was able to find a 50 ml bottle of this. I had to share it with you, of course, dear readers. My biggest question is always, is it worth the money? My Cognac experience is limited but this is by far the best one I’ve ever had. It’s complex and well integrated. Fruity but not sweet. For 40% ABV, it has a lot of power too. If I were tasting blind, I would never guess that it was that low. As a bourbon guy, I would still appreciate a bigger proof at this price, but cask strength Cognac isn’t really a thing so it would probably be unfair to criticize this on that basis. 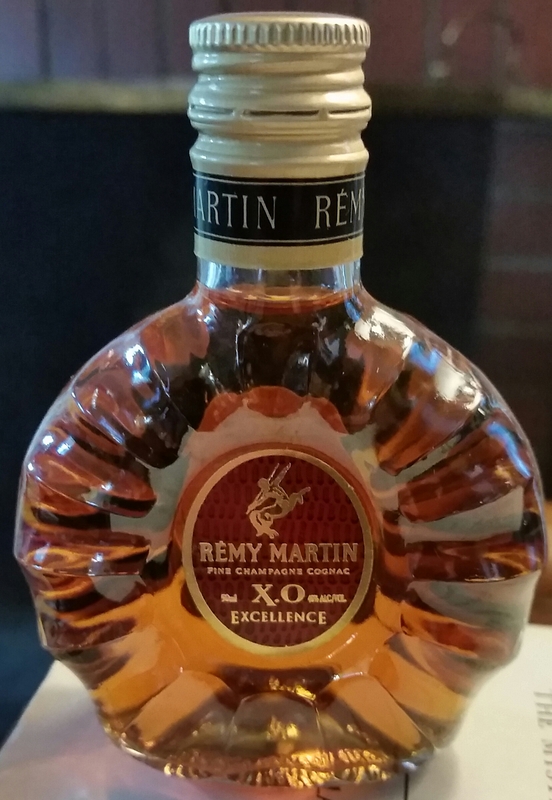 As elegant as it gets, Rémy Martin XO Excellence is recommended.